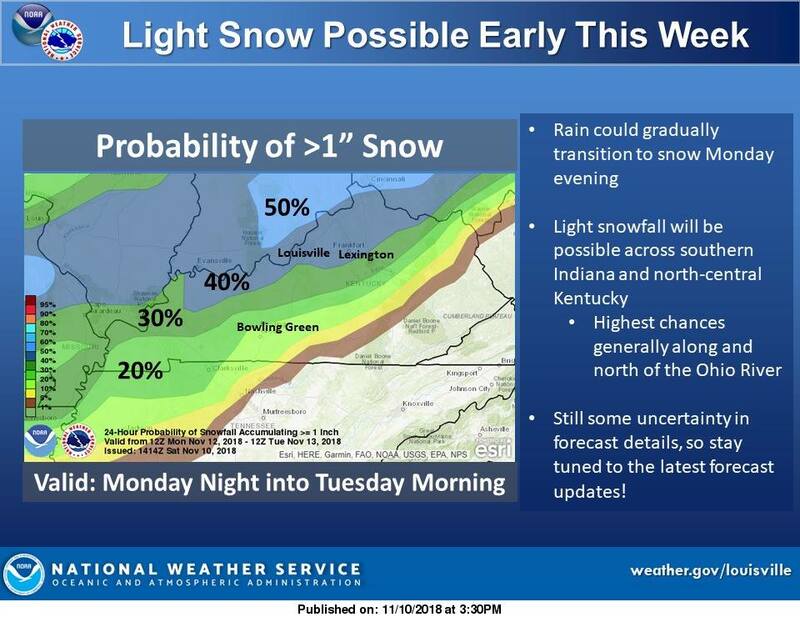 DUBOIS COUNTY -- The Dubois County area could see the first snowfall of the season Monday night as cold air continues to filter in to the region. We are watching Monday into Monday night. At this point, the National Weather Service expects the precipitation with begin as rain in the afternoon Monday, but could transition to snow Monday evening as cold air moves in from the north. There are still a lot of unknowns about the forecast and the different weather models are in agreement that we will get precipitation. The models are disagreeing, however, on the type and amount of precipitation. Right now, the weather service is calling for no more than an inch of snow for our area, but again, the NWS warns this forecast is likely to change between now and the time the system arrives Monday night. This could have some minor impacts on the roadways for your Tuesday morning commute (as of now... this can change). This is something we will be watching in the WITZ STORM CENTER. Stay tuned for the latest as the forecast becomes more clear.